All proceeds go to charity, of course. This is the new high-performance street legal track animal that’s been predicted to become a modern classic. The new 2018 Chevrolet Camaro ZL1 1LE is undoubtedly special, and the first one of its kind is heading to auction this weekend at the Barrett-Jackson event in Palm Springs, Florida. Powered by a supercharged 6.2-liter V8 with 650 hp and paired to a six-speed manual with rev matching, drivers will also benefit from a racing-tuned suspension and various aero tech, along with exclusive Goodyear Eagle F1 Supercar 3R summer-only tires. Compared to the "base" Camaro ZL1, the ZL1 LE weighs 60 pounds less and reportedly set a lap time at GM’s Milford test track that’s three seconds faster than the ZL1. The Camaro ZL1 1LE was designed and engineered for the purist driver...or collector. Barrett-Jackson has long been known as the venue that auctions the first off the assembly line for many special models, such as the first new COPO Camaro, Ford Mustang Shelby GT350R, and Corvette Z06. All of those went for $1 million a piece, and the Camaro ZL1 1LE will likely go for the same. 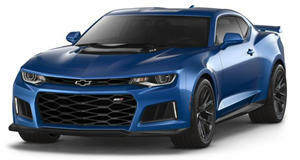 All proceeds of the Camaro ZL1 1LE VIN #001 sale will be donated by GM to United Way. Barrett-Jackson states this particular auction will take place this Friday evening. Happy bidding, everyone.